To most Californians, green salads and are a “thing”. We have salad bars, juice bars, raw diets, green smoothies, and will snack on carrot sticks and celery when trying to be healthy. 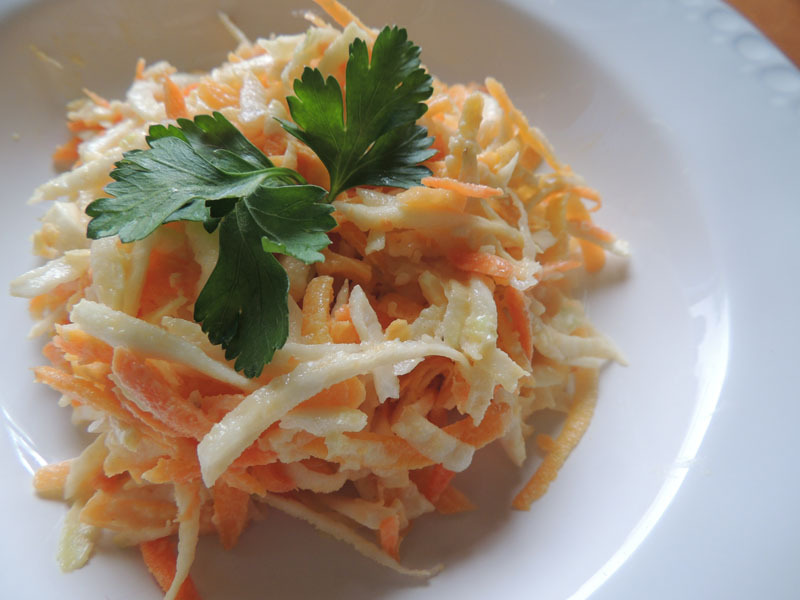 According to American-turned-Parisian pastry chef David Lebovitz, “Parisians don’t eat too many vegetables raw, with the exception of shredded carrots and celery root.” Thus, this celeriac & carrot salad is a menu item you will likely see at any Parisian bistro or cafe. It is so simple and takes literally 10 minutes to make (provided you are using a food processor). Celeriac, also known as celery root or céleri-rave, has a flavor reminiscent of celery stalks, but a texture that is firm and fairly fibrous (say that three times fast), but not so fibrous that you are pulling celery strings out of your teeth. It goes perfectly with the freshness of the carrots. First, prepare the dressing. It’s very easy – just mix together the mayonnaise with mustard and additional oil, and set aside. Save the salt and pepper to season at the end if you desire. Peel and grate the carrots. I use the shredding disc on my food processor to make it go faster, but if you have a mandoline that does thin julienne, you can use that as well. (The one thing I wish is that my lightning-fast food processor made longer, prettier strands, but alas, I can’t have it both ways!) 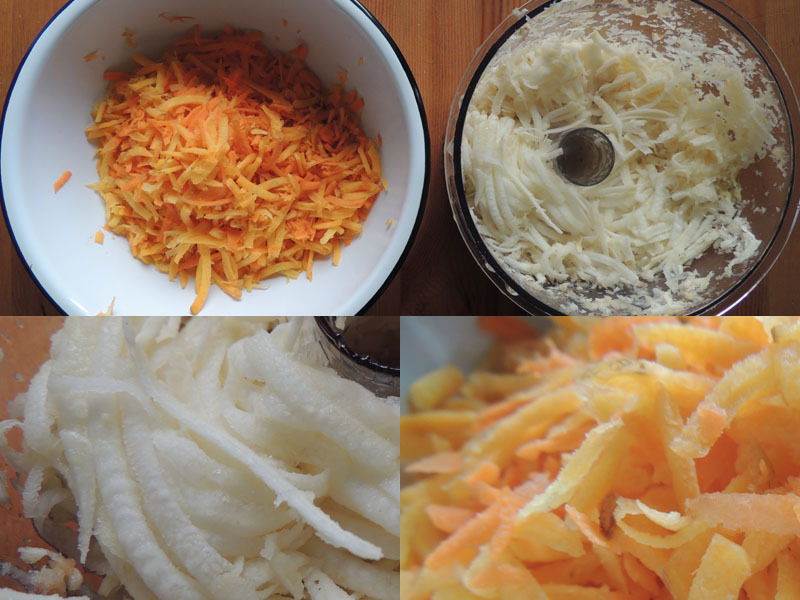 Put the carrots in a mixing bowl while you prepare the celeriac. 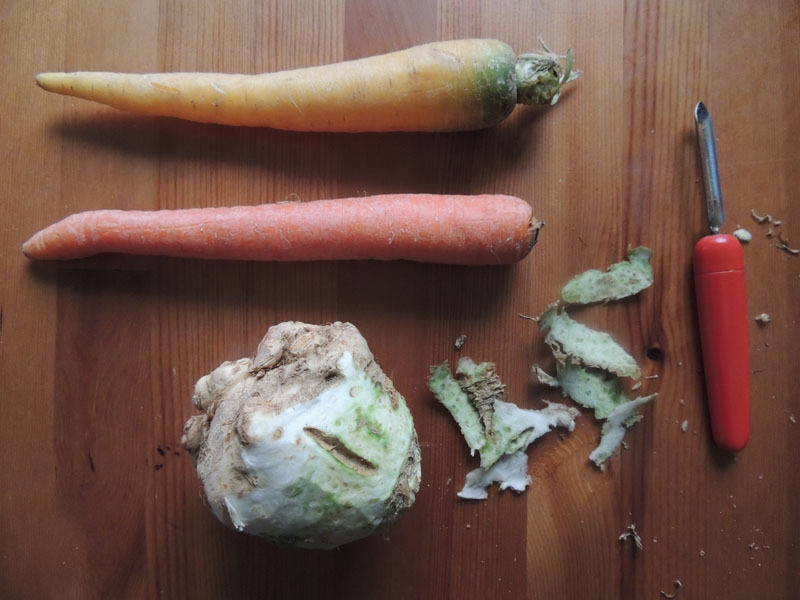 You can either julienne the celeriac by hand, or use the same food-processor method to shred the root. I squeeze some lemon into the shreds to keep it from turning brown – very important, because no one wants to eat oxidized looking veggies. Combine the celeriac and carrots in the mixing bowl, then add the dressing and mix well until all the strands are coated lightly. Salt and pepper to taste, and plate up like the photo below. Voila! Imagine you are sitting at a sidewalk cafe. saucisse de toulouse, but not cassoulet.